Digging for trash is my forte. I hear a theme song running through my head as I pull up to a pile along the curb. It eggs me on as I jump out of my Benz, usually in my pajamas as I have just dropped the kids off at school. My head buzzes with “one man’s trash is another man’s treasure, another man’s treasure, another man’s treasure” over and over again to the tune of “Mary Had a Little Lamb”. Some of you might call this a form of mental illness. I do not necessarily dispute this claim. However, I have the most amazing FREE stuff. I love it all. The cheaper and harder it was to obtain, the better. The coffee table on my sunporch. The huge map of the U.S. hanging on my wall in the family room downstairs, the bookshelves lining the walls of my laundry room. I could go on, but I do not want to bore you. 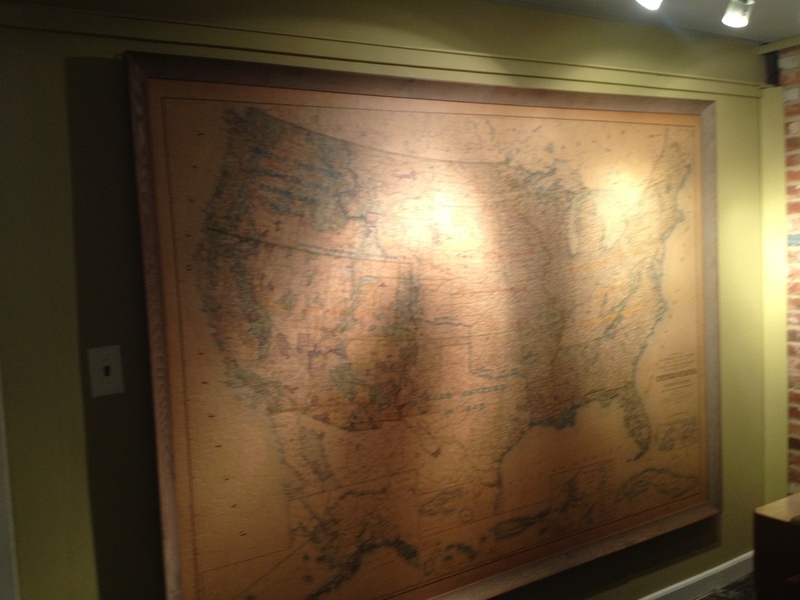 Family room wall with huge old U.S. map. Coffee table found in the trash. 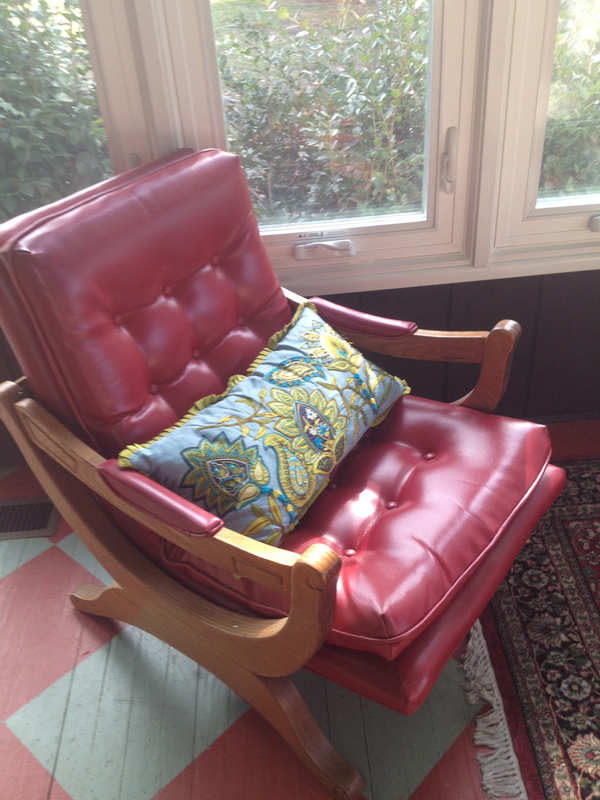 One of my favorite finds is a red leather chair. I spotted it in the thrift store and fell in love. I paid $35 for it and was thrilled to see the 1920’s bedding stamp from South Carolina on the bottom. This confirmed any lingering doubts I had about it being real leather. Most comfortable chair in the house. My latest find is a massive coffee table. It is solid wood and is truly hideous. It has a gold inlay in the top and is so large, I cannot think how it will do. I actually passed it by. Then, I saw it: the tufted top, upholstered in some funky fabric and on the shelf below enough space for at least three storage baskets. I grabbed it. Notice how even my dog is wondering what this massive thing is doing in the foyer. I can’t wait to show you how it turns out………Click here to see the REVEAL! Wow….what a great idea!!! I have been looking for something to use for that same purpose in my front hall, but I need something narrow. 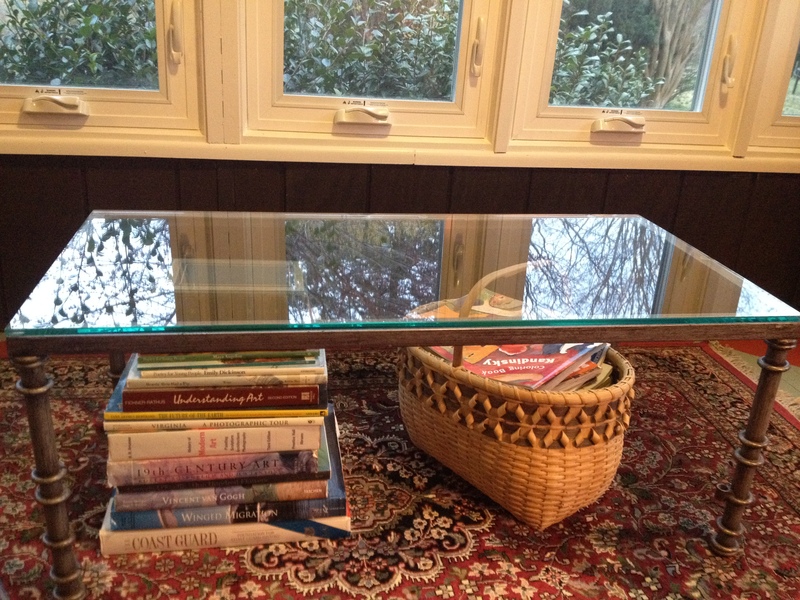 I never thought to look at a coffee table…. 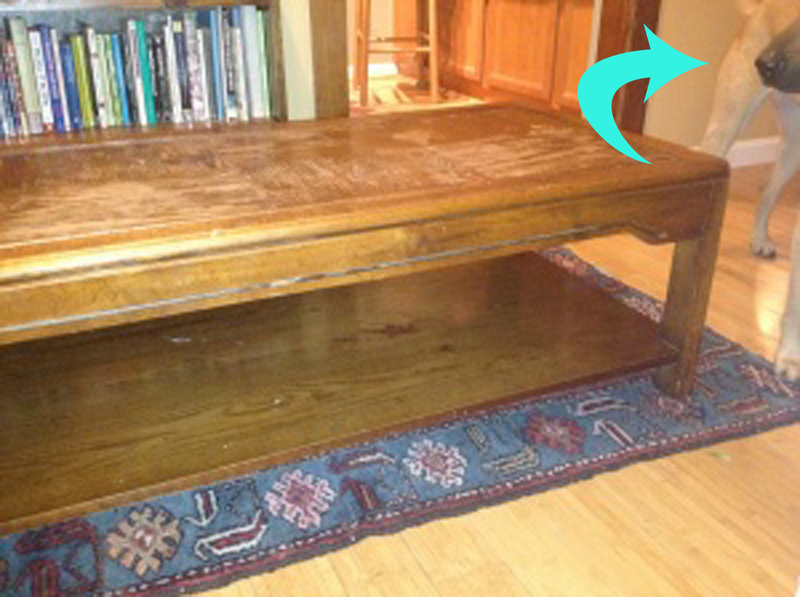 A coffee table is perfect as a bench in the front hall, especially one with a shelf beneath for baskets or shoes. I can’t wait to show you how well it came out.